I managed to spend some quality time with the DODOcase Color Block for the new Nexus 7. Inspired by the artist journals from the past, the cover offers a fresh take with a classic twist on the tablet case concept. 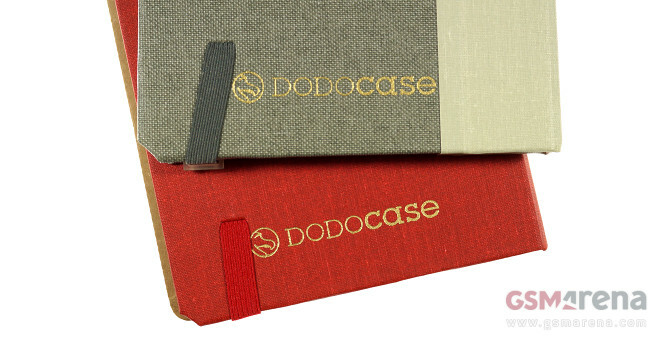 The DODOcase Color Block features a two-tone cover which consists of a color for the spine, along with another one for the front and back panels. The inside of the case is covered in high-quality fabric and sports DODOcase’s cool-looking, signature logo. The 2013 Nexus 7 is tucked into an eco-friendly, strength-tested bamboo tray. It provides access to all buttons and ports of the slate. The Color Block case looks and feels amazing in the flesh. Instead of holding Google’s latest tablet, the DODOcase creation takes you back decades by giving you the feeling of holding a luxurious hand-bound book. The engraved golden DODOcase logo on the back further adds to this feel. The ergonomics of the DODOcase Color Block for the 2013 Nexus 7, while not the best out there, are good. The case does add considerable bulk to the tablet, but considering the premium materials used in its making, this is hardly a surprise. The cover features a magnet, so it wakes up the tablet once you flip it open. Expectedly, the Color Block case also doubles as a kickstand. It works as expected. Spending time with the Nexus 7 2013 dressed in a DODOcase Color Block cover is a truly memorable experience. The handmade cover is as functional as just about any modern tablet case today, yet it offers visual and tactile sensation which pleasantly harks back to times past. I personally found myself reaching for my Nexus 7 a lot more often once I dressed it in a DODOcase Color Block. I highly recommend the DODOcase Color Block to anyone with the budget and taste for one. The case is hardly cheap at $79.99, but considering that it’s made in San Francisco by actual bookbinding craftsmen, it is easy to notice what you’re spending your money on. You can check out and order the Color Block case, together with the rest of DODOcase’s range for Google’s new Nexus 7 tablet over here.